1. Choose a space, a corner, back of a door, or wall. 2. 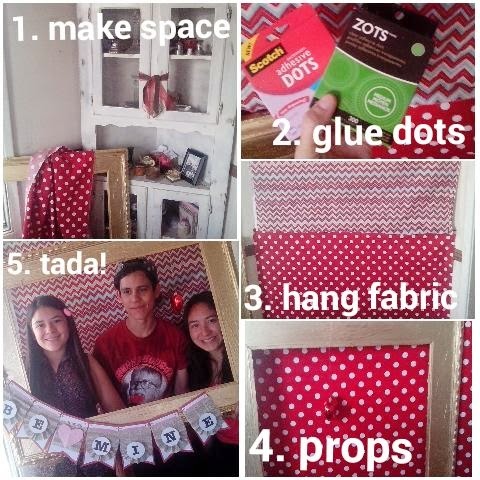 Use glue dots to hang your back drop. 3. Fabric works well-adhere flat against wall or across a corner using the glue dots previously mentioned. 4. Gather props-use what you have. Here we used an old junk frame that I previously been painted gold. Grabbed a Valentine banner from the mantle, Valentine picks from the dollar store and heart shaped Christmas ornaments, that guests could use. I arranged and put it all together in about 10 minutes tops! We've lived here for years and have never fully utilized our porch. The front of it is blocked by a large bush that is as tall as the roof. I'm thinking it was to block sound from the main street. 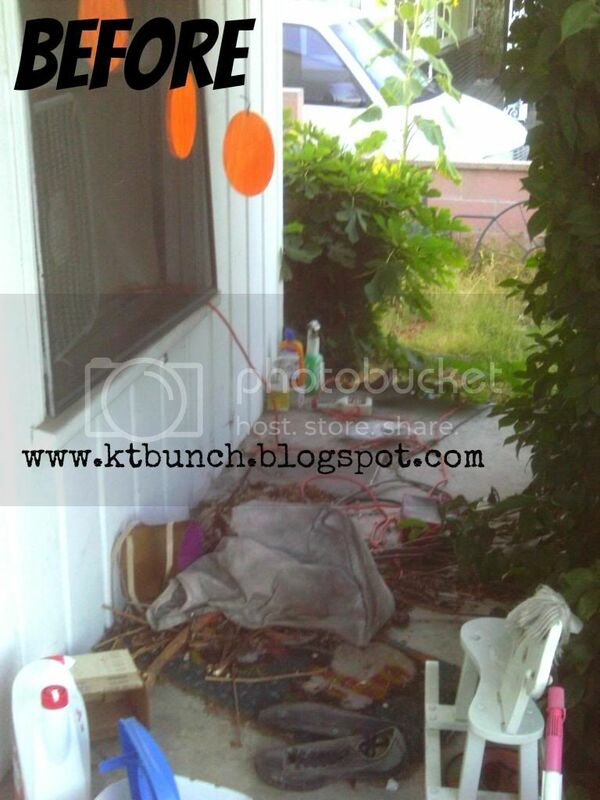 Since no one could see the porch, because of the bush, we mainly used it for extra storage space, aka: junk. My sister-in-love was over the other day and the house was retaining the summer heat. 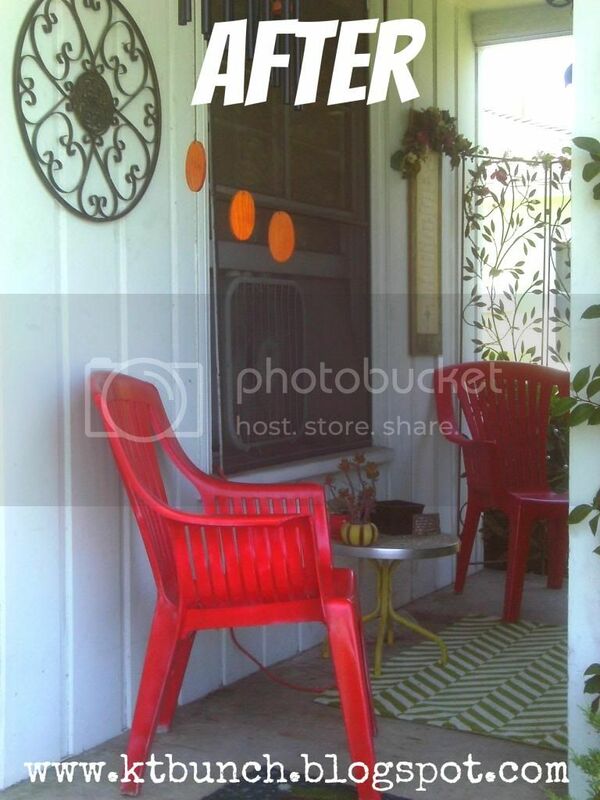 We took two of my new-to-me-freshly-painted chairs, squeezed them onto the porch to enjoy the breeze. It hit me that I could create a cozy space using what I had on hand. I cleared the junk and trimmed the bush back. I had a rug from Target that I got on clearance, moved a little table over, added twinkle lights and a room divider I had in my bedroom, hung a few wall items and candle sconces. Voila! I saw the most romantic outdoor shower, the other day at Cost Plus World Market. It was even on sale! 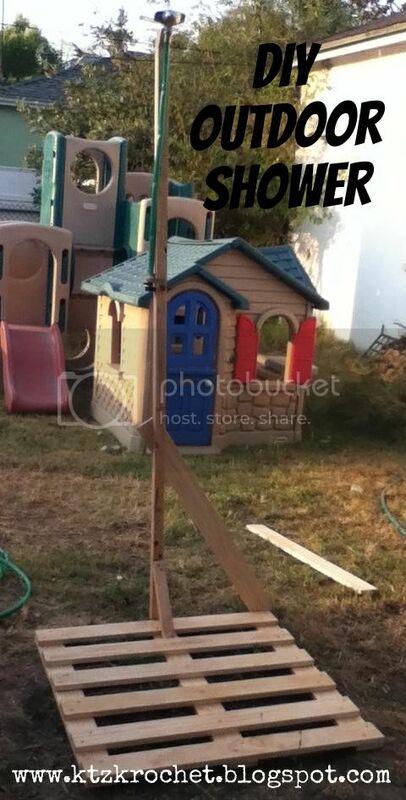 I have no good reason to need much less want, an outdoor shower. We don't have a pool. We don't live near the woods or any secluded area...we live in suburbia for goodness sake. Sorry, if you want to see a better and more details pic of it, click on the link in my intro sentence. World Market is pretty good at making their larger pix uncopyable. It has a brushed metal looking shower head and piping, petite, stained beams, an old fashioned handle, and even a handy soap dish! It's just fabulous, isn't it? They spent the afternoon gathering supplies and went to work to recreate it. Not the best staged picture or angle, either. But hey! Instead of a shower head they used a sprinkler. Instead of pretty piping they used green rubber hose. Instead of petite wood beams,they used 2x4s. No soap dish. It works though and it's pretty nifty. Now, I just need a reason to take an outdoor shower...I think the boys will get good use out of it when it's that time of day that all the heat is trapped inside our house and it feels 'too hot' to take a shower but that's exactly WHY know you need one. Sorry...my camera broke and I was MONTHS with out one. It was near torture. I would have to badger my oldest son to snap pix with his Ipod...and that only worked occasionally (the badgering, not the Ipod). I have been sewing and doing other crafty and artistic pursuits but not having pix made it really not fun to post about it. I have one now though. A friend gifted me one for my birthday Yay! 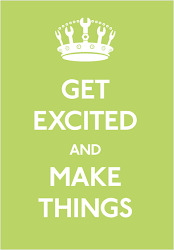 Stay tuned for crafty, artistic and DIY posts coming soon...if anyone is still out there? I no longer have a camera or a phone with a camera--so I am very limited to sharing my creations and recent craftiness with you. I have to bug my oldest son to snap a pic when I can. Here is a recent order I completed. A friend placed an order for her son's birthday and this is what I came up with. I added the mustache last minute, on a whim and I really like it. Yep, it's trendy, but still cute. The body fabric is light blue with small green frogs. The back of the owl's body matches but has large green frogs. The inside of the wings are a different fabric too...it's the light blue with tiny darker blue polka dots, it coordinates...I think that is what fabric I used. I can't remember exactly now. I think this was the first owl I made with really long legs and flappy wings. There have been quite a few others between this one and Mr. Owl with the mustache...but again--NO camera. boohoo! This one was also a birthday gift for a baby cousin. 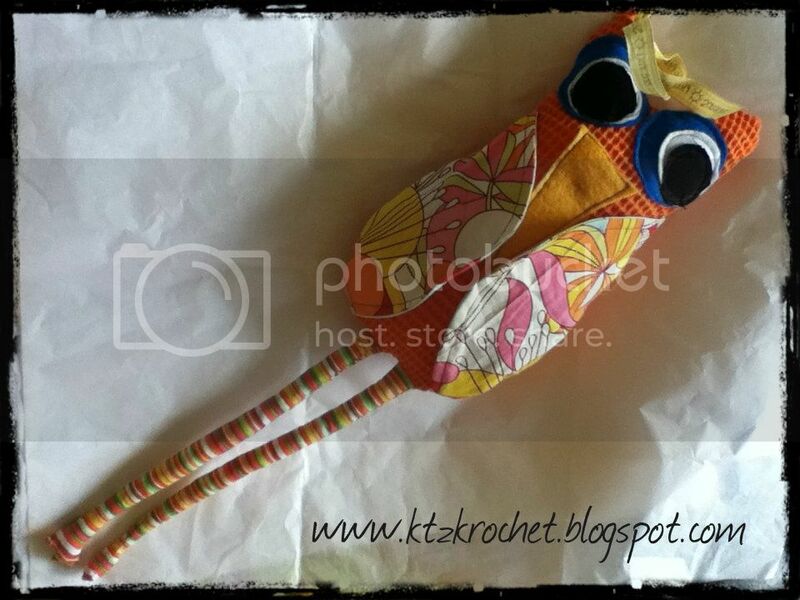 I created dollies with wings, turning them into fairies and Ms. Owl, with lovely eyelashes. each one is a totally unique, one of a kind creation. I get a color scheme from the client and then fulfill the order by mixing and matching fabric choices based on their color scheme. I have an order cut right now that will be using red, white and blue coordinating fabrics. She should be finished within the next few days. A few months ago I finally started a project I've been wanting to do for awhile. It's an art journal. 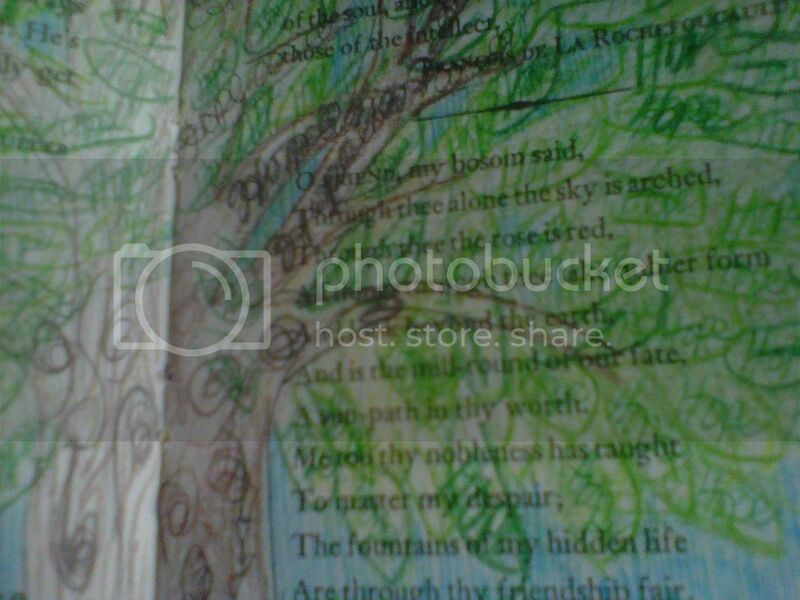 It combines basic journaling with more artistic flair...from what I can tell. I've also been using a technique often referred to as an 'altered book' because I took an actual hard back book and used the pages for my own purposes. 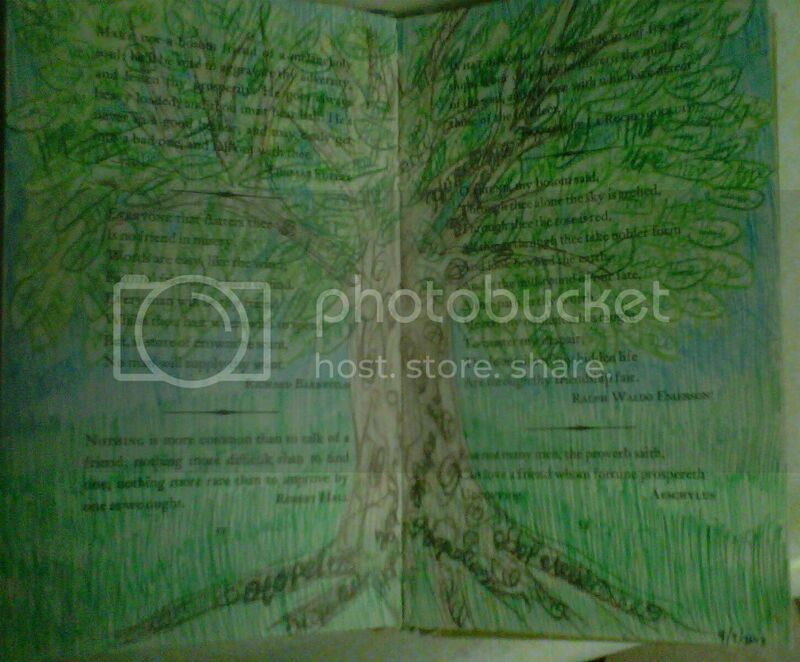 My book is a combination scrapbook, journal, and inspirational quotes and verses. So basically everything and anything, whatever I feel like at the time. 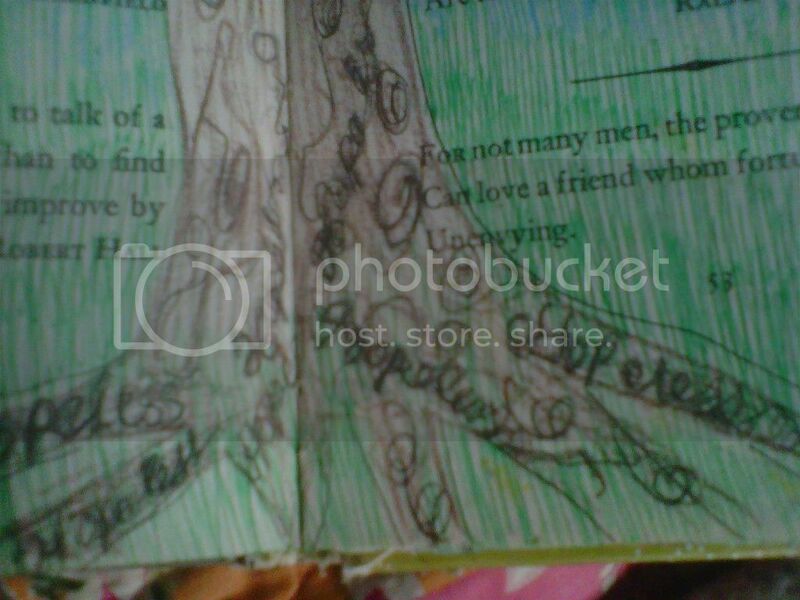 It's a sketch of a tree. The roots of the tree have the words HOPELESS in them. Whether you can see it or not, ALL the leaves have the word HOPE written in them. I have since learned there are two verses that refer to 'healing leaves'. Rev 22:1 Then the angel showed me the river of the water of life, as clear as crystal, flowing from the throne of God and of the Lamb 2 down the middle of the great street of the city. On each side of the river stood the tree of life, bearing twelve crops of fruit, yielding its fruit every month. And the leaves of the tree are for the healing of the nations. Eze 47:12 Fruit trees of all kinds will grow on both banks of the river. Their leaves will not wither, nor will their fruit fail. Every month they will bear, because the water from the sanctuary flows to them. Their fruit will serve for food and their leaves for healing." I did not even realize these verses existed. One night after our family prayer and worship time I asked one of my sons, "What is God telling you right now?" "Let the leaves awaken to speak." "What?" Did I hear that right? "I don't know, that's just what He said." "I know but what was it you said?" He repeated himself and I knew immediately it related to the picture-he knew nothing about it. I showed him and felt pretty excited about it. The next day I unexpectantly met with a friend to pray. She happened to reference the Revelation verse quoted above with out me even mentioning my picture. I was excited to show her and tell her what my son had said. God works like that, putting all the puzzle pieces together. He speaks to us in images, words, thoughts, ideas...through any and everything. This was extra fun for me because I rarely draw...my children are always drawing prophetic pictures at church. So this was a new experience for me. I really enjoy the art journaling because it allows me to create a page and fulfill my urge to create, rather quickly and easily. I mostly use layered papers and stickers to create a page I can write on. I also have verses. 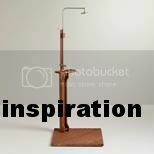 I will add more posts with pix of other pages, later. I was searching for a dress for my graduation and this one at Target caught my eye. It was $24.99. The fabric was a nice and soft polyester. It didn't seem to be a very complicated style though...or so I thought. I was sure I could recreate it myself. I loved the knee-length and the no-cleavage-show neckline. Here is the inspiration dress--from the dressing room in Target. Initially, I went to work to find a pattern. Guess what? NO pattern. Trust me I searched the pattern books, online AND in person. I was going to have to go this *alone*. I did find an online tutorial for a sleeveless maxi-dress that had a slight drape along the neck--but otherwise, it was nothing like this dress. I used that tutorial simply as a yardage reference. It recommended 1.5-2 yards of fabric. I also wanted this deep magenta color. I headed to Joann Fabric's to see what I could find. I purchased the closest thing to magenta they had and a green in the same--both fabrics were polyester, which is exactly what the original fabric was. Oh! 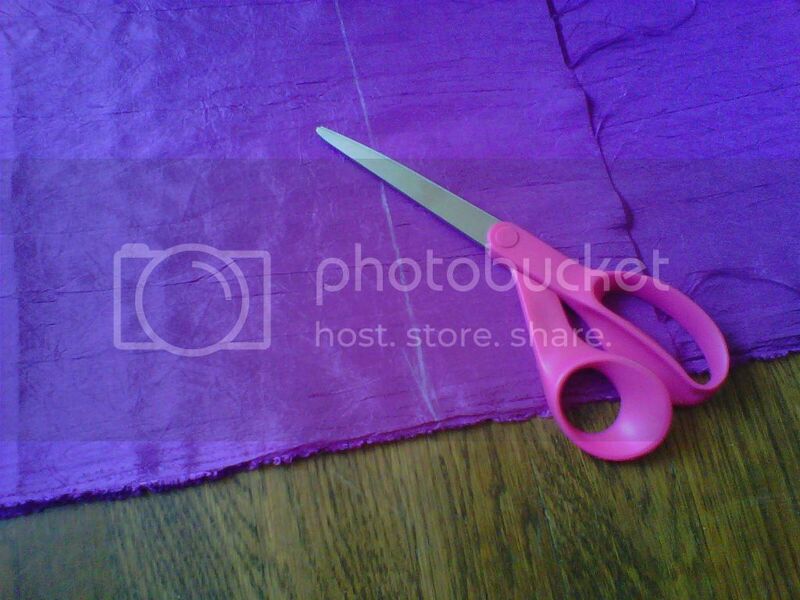 I was SO afraid to actually CUT the fabric. I finally went back to Target & purchased the original dress so that I could take it's measurements and inspect it a little more closely. I purchased it in green so I would not be tempted to keep it. I wrote down all the measurements and promptly returned it. I finally built it, after fighting with the bobbin thread. The front was not as drapey and the sleeves were too short? I realized the front was supposed to be 48 in across and I had cut it to 36 in across. EEK! Ok...I cut two panels and added them to each front 'sleeve'. Ok..it could work. I sewed an elastic waste. I used a circle of elastic I had in my stash--from a pair of underwear (I always salvage the elastics) one of the dogs had chewed! The waist ended up being a tad bit too high and the sleeves a bit uneven. BUT otherwise, I LOVE it! I tied the sleeve edges together and you don't even know they are uneven! It was a little breezy when I took this pic. Sorry. I wore this dress to my graduation banquet. Then I found another polyester fabric that had a different weave that was much closer to the fabric of the original dress...I knew I just HAD to use it for my actual graduation. THIS is my entry for the sewing challenge! The school colors are black & yellow. My DIY invitations -announcements were black and white polka dots with a yellow ribbon accent. I knew I just HAD to get this fabric and accent it with yellow. The sleeves came out much better since I paid better attention to the correct measurements the second time. haha. This fabric draped much nicer. 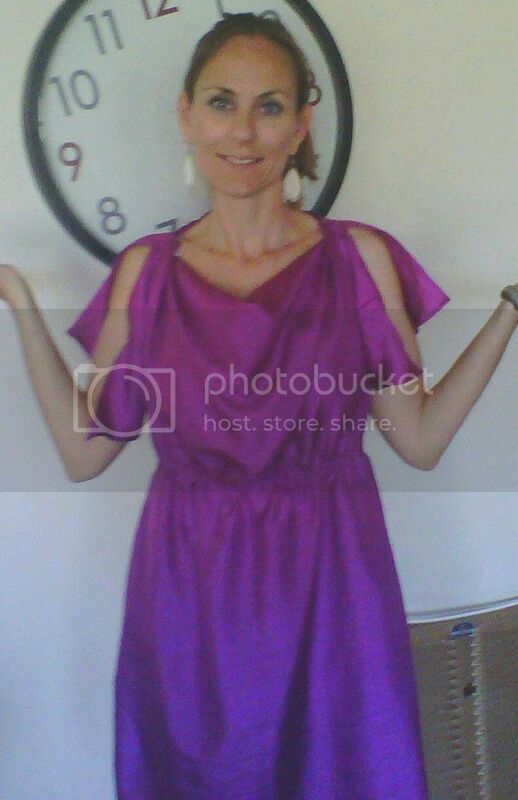 The neckline actually drapes lower than this picture implies. The hardest part was the shoulder seams. The front neckline is actually folded under and sewn to itself with the back neckline in between. It created some trickiness for sure. What I love most about this style is the ability to dress it up with accessories and heels or dress it down with casual flip-flops and no belt. As far as building it-it's also VERY forgiving to create. The addition of a belt or ribboned waist hides any perceived flaws in the elastic waistline. It's also a flattering shape for the body because it is not clingy. It's comfortable and easy to move in because of the flow and loose style. Do you want to make one of these dresses now? I think you should. I'm thinking there are so many possibilities....ribbon tied shoulders? tank cut shoulders? etc. Just keep picturing it as basic shapes: rectangle bottom and upside down triangle for the top. Voila'! If you make one...be sure to share it w/ me cause I'd love to see it.